August is Summer’s climax. It is the epitome of abundance and so what better time to hang out with fellow Soulful transformationalists like you? 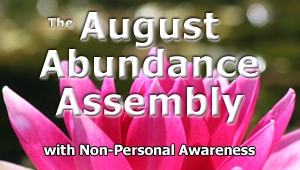 The intention of The August Abundance Assembly is for us to come together as a group to explore and transform our relationship to wealth, money & abundance. • Your relationship to monetary wealth and who you experience yourself to be in that area. shifts your heart is calling for can be facilitated. If you’re interested in joining this adventure of inquiry & transformation, then click the image and find out more! If you really want to get to know NPA, the best way is to engage with it through our events. Come and experience real people and real transformation with NPA. Have fun and take away a wider perspective and a deeper understanding of the tool we give away. Let the message of easy peace sink in, and begin a more authentic, kinder relationship with life. NPA is a refreshingly simple, yet hugely powerful new approach to transforming the stuckness in your life, and stepping you into a brighter new reality. Even deeper than that, it’s a new perspective that can help you integrate a lot of the disparate modern spiritual and personal growth ideas and can help you ‘Land’ a true and alive sense of wholeness into your ‘early 21st Century’ incarnation. It’s creator, Joel Young and the Certified NPA Teachers are passionate about sharing this perspective with the world. It will be VERY valuable use of your time to attend The NPA Expansive Weekend. If you’re looking for The NPA Masterclass, Absolute NPA (Retreat) or The Certified NPA Teachers Training, they’re under the ADVANCED tab.